Yeah, but: Funny: peculiar or ha-ha? 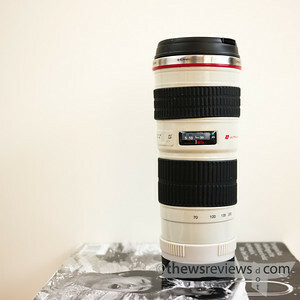 The Long Version: These mugs have been a huge phenomenon - there are probably more people looking for one of these than the replacement for the 50D. 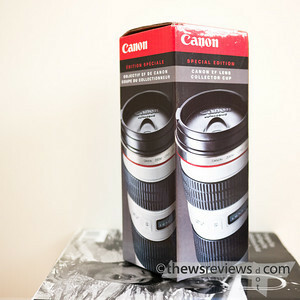 Canon has always had a way of building up buzz, and this is no exception. Highly sought after and rarely seen, this replica is a brilliant idea. And there's no saying how much milage they could get out of it - a 300/2.8 pitcher, 85/1.2 coffee cup, 50/1.8 shot glass - the possibilities are tremendous. But alas, some dreams are best left as fantasies: I have to say that it looks better in photos than it does in person. The packaging has the same image on all four sides of the box. The top is sealed with a clear plastic sticker, but the bottom is simply the four sides folded inward and can be undone. Inside, the mug is in a loose clear plastic bag, and includes a small paper slip with care instructions on it. Aside from all the obvious warnings about hot beverages, spillage, and metal in a microwave, the 70-200 mug also isn't for carbonated beverages and has to be washed by hand. That means that its pristine collector status is in no danger from me - I'm not about to use anything that can't be put in the dishwasher. 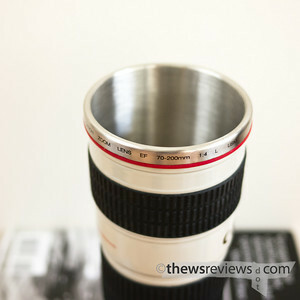 The 70-200 does have a metal inner liner, suggesting that it could be used as more than a novelty item. And perhaps, like a Leica, keeping it protected on a shelf is to keep it from its true calling. I occasionally get together with a few photographer friends to relax and compare prints in a local coffee shop, and the idea of using this mug is pretty tempting. If they didn't know that I mostly use Nikon and Panasonic, it would be even better. I said in the beginning that this cup might be better as an idea than a reality, but perhaps I'm being too harsh. The level of detail is good, but not exacting; the rounded corners to the plastic give it just hint of a Burger King feel. But the key is that it's a tribute, not a replica - it doesn't look like someone actually hollowed out a real lens, it looks like someone made a mug that looks like an actual lens. Aficionados like myself can immediately recognize which lens it's supposed to be, and when Penny saw it, she laughed out loud and thought it was great. Since she's not a photographer, but has to put up with one, that's a stronger endorsement than anything I could come up with on my own. Hopefully Canon takes the idea and runs with it.